I sit here in Chicago during this Christmas Season, imagining a Christmas wedding ceremony one hundred and nineteen years ago. Marriage License of Hermon Atkins MacNeil and Carol Louise Brooks issued on December 24th, 1895 and completed on Christmas Day 1895 by Rev. Edward F. Williams, Congregational Minister. Both Hermon and Carol were sculptors. Hermon had completed 4 bronze relief sculpture panels for the new Marquette Building. They had fellow friends among the art community, sculptor colleagues from the Chicago World’s Fair, students and teachers from the Art Institute of Chicago, and “White Rabbits” team of women sculptors. We don’t have any record of who might have witnessed their nuptials. The officiating minister, Rev. Edward (Franklin) Williams appears to have been a prominent clergy described as “a Congregational minister, educator, field agent for the United States Christian Commission, missionary, and writer.” ( Source: Edward Franklin Williams papers, Amistad Research Center at Tulane University, New Orleans, Louisiana ) He wrote Carol’s name as “Carrie” in his handwritten certification on the bottom of the license. She went by ‘Carrie’ among her friends. Whether Rev. Williams considered her a ‘friend’ we do not know. Philip Khopf, the Cook County clerk, wrote ‘Carol’ in the top portion of the certificate. Rev. Williams could have copied “Carol” from the official record above, but chose to use ‘Carrie’ instead. The license lists Carol as being 24 years of age and Hermon as 29. We know that the minister was 63 years of age when he led their ceremony. Until 1891 he was pastor of the South Congregational Church, in suburban Chicago. For health reasons he had “an extended stay abroad (June, 1891 to July, 1893), primarily in Germany, where he pursued studies in Berlin.” Returning to Chicago he studied and lectured at Chicago Theological Seminary during 1894. Whether Rev. Williams had some previous knowledge with Carrie and Hermon or was a friend of the family, is uncertain. He seemed very connected to the Chicago community and many of the potential benefactors of the arts. At a minimum, his use of “Carrie” seems to indicate a ‘cordial’ style of ministry and interaction. It also seems consistent with his servant-attitude toward needs of the soldiers and wounded he encountered during the Civil War. More biographical information on Rev. Williams is offered below. Historical Note: Edward Franklin Williams was a Congregational minister, educator, field agent for the United States Christian Commission, missionary, and writer. Edward Franklin Williams was born in Massachusetts in 1832, the son of Delilah Morse Williams and George Williams. Williams attended Yale University from 1852 to 1856, and he continued to earn an advanced degree from Yale. He later attended the Princeton Theological Seminary, where he graduated and earned his license to preach in 1861.Williams was exempt from the draft due to a tubercular condition in his lungs, and thus he did not fight in the Civil War. In April 1863, Williams received a commission as a field agent for the United States Christian Commission. With the Commission, he served two and a half years in the armies of the Potomac and the James.After the war, Williams was sent as principal to begin was became the Lookout Mountain Educational Institutions in Chattanooga, Tennessee. In 1867, Williams was appointed by the American Missionary Association to teach in the Normal and Preparatory Division of what was later Howard University. He left Howard to preach at several churches in Massachusetts, Pennsylvania, Illinois, and New York, ultimately serving as pastor of Tabernacle Church in Chicago and Forty-Seventh Street Congregational Church, which later became South Congregational Church, in suburban Chicago, where he served until 1891.By 1880, Williams was writing a monthly column for The Congregationalist under a pen name, “Franklin.” He continued writing for this publication until 1908. He continued as a prolific writer, particularly in the 1890s. From 1901 to 1911 Williams served as pastor of the Evanston Ave. Congregational Church in Chicago. Williams died in 1919 in Chicago. On a cold December day we took the CTA Blue Line to Jackson street and walked out of the underground on Dearborn Street at the Federal Court Building. 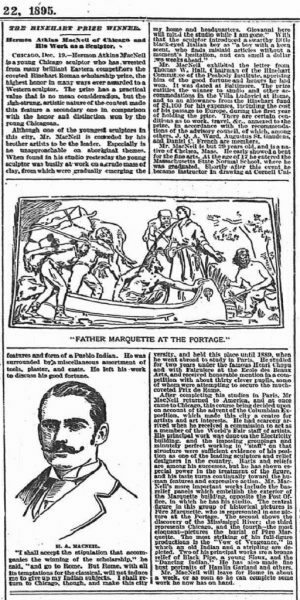 We were just a block south of the Marquette Building which is home to Hermon MacNeil’s 1895 sculptures of 4 bronze relief panels [Cick Here] that tell the story Father Marquette explorations to Native peoples of Illinois. We walked past the Federal Courts, then turned east toward the Art Institute of Chicago. There sculptor Edward Kemeys’ twin bronze Lions (Mr. Defiance and Mr. Prowl) greeted us at the entrance in their Holiday regalia. They have stood guard there since 1893 when Mrs. Henry Field commissioned them. Above is “Mister ‘In-an-Attitude-of-Defiance’,” as he rests on a Christmas package that normally is his base. The mood was festive as sixty people smiled and waited on the steps (between Mr. Prowler and Mr. Defiance) until the Museum doors were opened at 10 am. 1) Prowler and Defiance, 2)Mrs. Henry Field, and 3) Hermon MacNeil are all contemporaries of the 1893-95 era of the Chicago World’s Fair (Worlds Columbian Exposition). Once inside we spent the morning admiring early art of Dutch and French collections. Eventually, we came opon a fovorite, Jules Adolphe Breton’s The Song of the Lark, (1884). Part of the Field Collection, French artist, Jules Adolphe Breton’s The Song of the Lark, 1884. is admired by a happy visitor. After some lunch in the modern art area, we went to find MacNeil’s “Sun Vow”. Here are my results. While I could go on-and-on about this most famous of Uncle Hermon’s works, I will let my photographs speak for themselves. Enjoy!